I don’t like musicals, on stage or film. I dislike them because they take a perfectly good drama and add egregious singing and dancing that does little to advance the story or explore the characters. (Like James Joyce’s The Dead on stage or Light in the Piazza.) So I won’t be seeing or reviewing Les Miserables (I suggest Victor Hugo’s book instead). 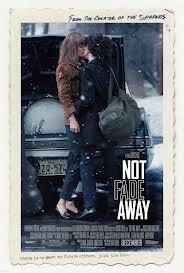 But I’m excited about a new film with music titled Not Fade Away — a rock and roll film set in the 1960s. As one reviewer said, a great movie is always about more than what it’s about. * Not Fade Away is written and directed by David Chase in his first project since The Sopranos. Chase clearly loves this music. His film is about kids who want to be rock and roll stars. And it has lots of music. Constant music, in fact. But don’t call it a jukebox movie. It’s far more than that. It’s an exploration of the cultural upheaval of the ‘60s – in music, TV, film and politics. And it’s another chapter in the story I started to tell in my earlier essay, The Rock and Roll Escape Route. Rock and roll has often been an escape for teenagers who perceive their families living dreary, ordinary lives that they do not want to repeat. In Not Fade Away, Doug, an Italian-American kid in New Jersey, and his friends form a band; practice in a family garage, and play teenage gigs. Doug starts on drums and turns out to be a pretty good lead singer. They produce a demo tape and make a contact with a record producer, who outlines for them all the practicing and performing they need to do before they will be ready to audition for a record contract. There are several subplots, including Doug’s relationship with his father (played by James Gandolfini) who doesn’t understand Doug’s dreams, his long hair or his dress. The romantic subplot involves Grace, a girl from a wealthy family, and includes an unnecessarily complicated subplot about her sister, who suffers mental illness. The band members are unknown actors and do a credible job with the music. * Keith Uhlich in Time Out New York, 12/17/12.